Who doesn't want a taste of the 'Red-Rum'? If you're of age and absolutely have to get out of the house and away from your family, what better night to do it than Thanksgiving Eve? The unofficial biggest bar night of the year is a time to step away from family for a few blessed hours before diving into a full day of pretending to remember that one cousin and eating your weight in mashed potatoes and 3 kinds of pie. Opened by veteran bartender Jacob Trevino and partner Ott Baum, the 76-seat Overlook isn't scary, but takes its look from the infamous mountain lodge in the Stanley Kubrick classic, with speciality cocktails including The Hatchet (tequila, ginger, lime and Spanish-spiced rim), The Writer's Block (bourbon, apple-berry sweet tea), Snow Tracks (gin, rosemary-thyme, limeade) and, of course, the Red-Rum (rum, strawberry-clove, lime + cranberry beer). Among the subtle touches are Jack Nicholson's eyes rendered in tile under the bar, a recreation of the film's iconic mural and a manual typewriter at the door where you can write "all work and no play" all night. "People don't want to just go out and have a drink, they want to have an experience," said Overlook co-owner Trevino. "Our whole vision was to create something they'd never seen and take them on an adventure." A hidden message behind a photo in the women's bathroom. "We started with a rustic feel and I started thinking of iconic lodges," said Trevino, who wore his favorite 'Shining' referencing rocket ship sweater during a chat with MTV News. "And Stanley Kubrick is such a visual director it gave us so much to pull from. And also if you've seen [the documentary] 'Room 237,' it has all this conspiracy behind it so there was a lot of ways we could work in all these little inside homages to the movie." Some of them include a banquet made of the same material from Nicholson's character's coat in the famous ax scene, the axes on the wall, a CB radio and a can of Calumet on the shelf behind the bar. This Portland horror dance club pays tribute to "the world of horror in all its forms with Lovecraft and classic horror inspired and local art and decor." Come for the spooky vibes, stay for drinks like the "Terrorvision," "Reeker," "The Prowler," "Club Dread" and "Unpleasant Dreams." If "Night of the Living Dead" is your thing, this 52-seat Minnesota half dive bar/half cocktail lounge is it. "Donny Dirks, is the only place where big brains are truly safe, and the zombies know this...somehow. They know for a fact that the best brains are inside and they want in!" Kicking it old school, Dirk's offer's the "Night"-inspired "Barbara's Dead," the "Manos: The Hands of Fate" derived "Torgo's Torment" and the "Shaun of the Dead" homage "Cask Aged Zombie." A music venue, bar and "nerdvana," this "Doctor Who"-inspired Brooklyn drinking hole hosts killer indie acts and offers drinks like the "9th Doctor" (Absolut Citron, orange juice, Pimm's), the "10th Doctor" (Absolut Citron, orange juice, Blue Curacao) and, duh, the "11th Doctor" (Absolut Citron, orange juice, melon liquor). And because they just love movies, they also offer the "Mr. Pink," "Shirley Temple of Doom" and the "Kent Brockman." Belly up to this aviation-themed Disney Springs watering hole in Orlando named after Indiana Jones' pilot in "Raiders of the Lost Ark" and quench your thirst with alcoholic and non-alcoholic drinks including Poisonless Dart, Shorty's Singapore Sling, German Mechanic, Hovito Mojito and, wait for it, the Scottish Professor. Located on Simpson's Fast Food Blvd. at Universal Studios Orlando is the only place you can reliably get Duff Beer and a Flaming Moe. If you happen to be in Los Angeles this week and your family tradition includes watching "Titanic" for the 100th time (okay, so we're a bit weird, deal with it), then Cafe Jack is for you. 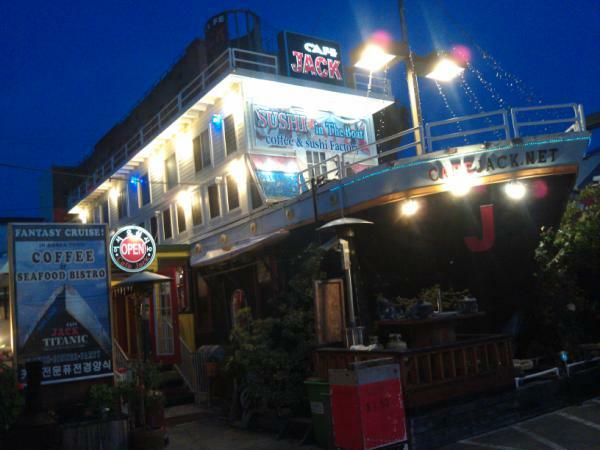 Housed in what looks like an ocean liner that's hit land, this Korean restaurant is full of "Titanic" memorabilia and serves a number of speciality rolls including the Jack Rose Roll and the traditional rice cake dish Royal Captain DBk. Okay, it's not just a bar, but c'mon, it's in a ship!